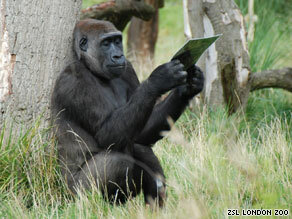 A new male gorilla is due to arrive at the London zoo later this year. 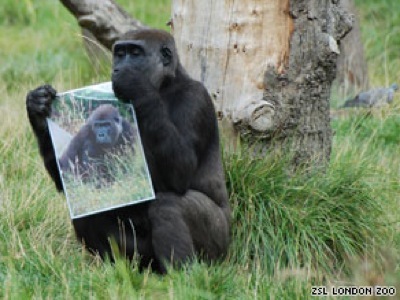 To prepare them, the keepers gave each of the zoo’s three adult female gorillas a picture of their pending paramour, and the gorillas went, uh, ape. One female gorilla shrieked in delight, while another wedged the poster in a tree to stare at it. A third, clearly overcome by emotion, held the photo close to her chest — then ate it. This made me very happy. This entry was posted on Friday, September 4th, 2009 at 6:49 pm and is filed under acting, funny, heartwarming, it's made of science!, love. You can follow any responses to this entry through the RSS 2.0 feed. You can leave a response, or trackback from your own site. Possibly influenced by the euphoria of new stationery supplies. I hear it’s a worldwide phenomenon around this time of year. I’d prolly eat whatever’s inside a laminated folder myself, come to think of it. Shiiiiny.